Abu Dhabi, UAE – 02 January 2019: The Emirates Nuclear Energy Corporation (ENEC) participated in the Al Dhafra Festival, which took place in Madinat Zayed, in the Al Dhafra Region of Abu Dhabi, between 17 December 2018 and 1 January 2019. ENEC’s participation was the result of its ongoing efforts to support the economic and social development of the Al Dhafra Region, and the achievement of Abu Dhabi Plan. Held under the patronage of His Highness Sheikh Mohamed bin Zayed Al Nahyan, Crown Prince of Abu Dhabi and Deputy Supreme Commander of the UAE Armed Forces, the Al Dhafra Festival is organized by the Cultural Programs and Heritage Festivals Committee to promote Emirati heritage and preserve the UAE’s cultural legacy. As a Social Engagement Sponsor, ENEC drew inspiration from the UAE’s founding father Sheikh Zayed bin Sultan Al Nahyan, and updated visitors on the latest developments in the UAE Peaceful Nuclear Energy Program, highlighting its economic, social and environmental benefits. ENEC, through its participation in the festival, continues to raise awareness of the importance of reducing the nation’s environmental footprint, while also promoting Emirati culture and educating attendees on the benefits of peaceful nuclear energy. “Our continued participation in the Al Dhafra Festival is in line with our commitment and dedication to engaging with the people of Al Dhafra, who are our major stakeholders,” said H.E. Eng. Mohamed Al Hammadi, Chief Executive Officer of ENEC. 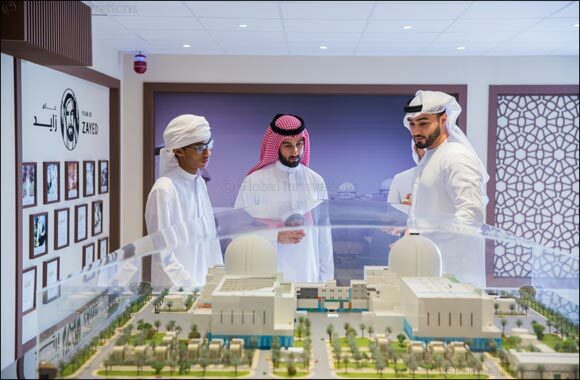 “We are also keen to keep the people of the Al Dhafra Region, the home of the Barakah Nuclear Energy Plant, updated on the developments of the plant and its contribution to the economic and social growth of this area, and the wider UAE,” added Al Hammadi. “ENEC's continuous participation in community events held in Al Dhafra is in line with our leadership's directives to preserve our heritage, in addition to working hard for the prosperity of our nation,” concluded Al Hammadi. ENEC’s stand at the festival was popular with visitors, some of whom were presented with paintings about the lessons learned from the late Sheikh Zayed bin Sultan Al Nahyan's journey. Visitors also had a chance to participate in a range of educational activities related to the peaceful nuclear energy industry. ENEC is committed to community engagement and continues to ensure widespread awareness and understanding about peaceful nuclear energy in the UAE. The last national poll conducted by the independent global market research company Nielsen, showed that the UAE public strongly supports the use of peaceful nuclear energy, with 91 percent of UAE residents stating that peaceful nuclear energy is important for the nation, while 82 percent of Al Dhafra residents believed that the nuclear energy is a safe, clean, reliable, and efficient way for electricity production.